This image from NASA's Aqua satellite shows a major fire raging near the coastal city of Sendai in northeastern Japan after the massive 8.9-magnitude earthquake that struck on March 11, 2011. This image was taken by Aqua's MODIS instrument on March 12. NASA satellites have snapped new pictures of the devastating floods and fires in Japan from the deadly earthquake and tsunami that struck the country on Friday (March 11). Photos from NASA's Earth-watching Terra and Aqua satellites paint a stark picture from above of the damage by the massive 8.9-magnitude earthquake and the subsequent tsunami it spawned. They show Japan's northern region, particularly the city of Sendai – which is visible inundated by floodwaters and fires in the satellite views. The photo from NASA's Aqua satellite was taken at 2:46 p.m. Local Japan Time and shows a dark plume of smoke emanating from the Sendai region. The black smoke can be seen blowing far out to sea. Scientists used the Aqua satellite's Moderate Resolution Imaging Spectroradiometer, or MODIS, to generate the photo-like view. The Aqua satellite image also shows clouds of blue and green sediment along the coastline of Japan, which may be mud or other debris churned up by the powerful tsunami waves, NASA officials said. This image from NASA's Terra Satellite shows extensive flooding along Japan's northeastern coast near the city of Sendai after a massive tsunami caused by the 8.9-magnitude earthquake that struck the country on March 11, 2011. This image was taken by Terra's MODIS instrument on March 12. The floodwaters appear in dark blue or black and stretch well inland of the coastline when compared with another Terra image taken on Feb. 26, before the earthquake. This image from NASA's Terra satellite shows Japan's northeastern coastal region near the city of Sendai as it appeared on Feb. 26, 2011, before a massive 8.9-magnitude earthquake struck the region and caused a tsunami that led to extensive flooding on March 11. 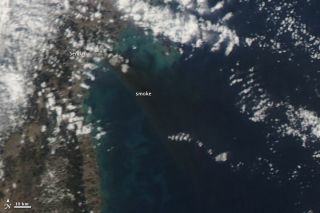 "MODIS detected a fire burning near the shore north of Sendai," Riebeek wrote, adding that the fire is noted with a red box in the image. "It is also surrounded by floods." The March 11 quake was the largest ever recorded in Japan and is the world's fifth largest earthquake to strike since 1900, according to the U.S. Geological Survey (USGS). The epicenter of the earthquake was 231 miles (373 kilometers) northeast of Tokyo and 80 miles (130 km) east of Sendai, Honshu, according to the USGS.